This week’s Travel Tip is from Ted, who lives in Chicago. Happy #traveltuesday dear readers! Talk about an odd couple. 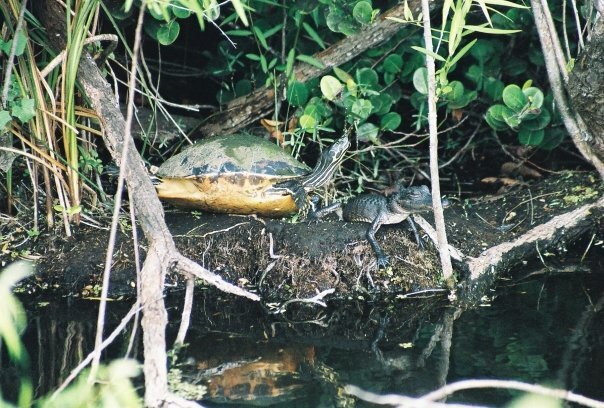 Here are two natural enemies just chilling on the shoreline. In a couple of years this baby alligator will not see his friend here as a mate to spend a lazy afternoon with, but will see him as prey. Some drunken jerk vandal decided to pick up one of the nice trees that lined our street and carry it over to the other block for some dumb reason. Or was it a drunk? Anyone seen the movie the Two Towers? Ever hear of an Ent? Maybe this tree is an Ent and just decided to mosey over to the sunnier side of the street. 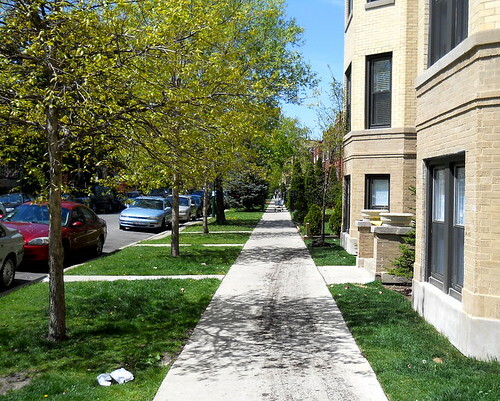 I joked with the members of our condo that the tree migrated to be on the cool side of the street (i.e. the side where I lived,) but no one from the other side replied to my jest. Hanami is the festival in Japan where the blooming of the cherry blossoms are celebrated. 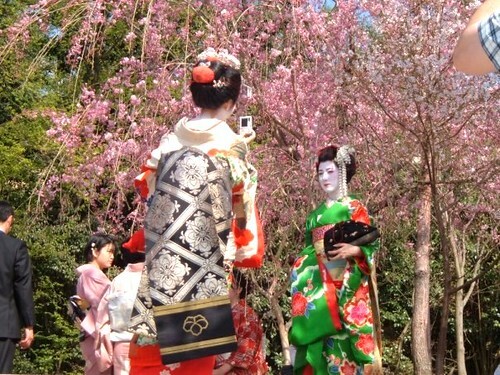 Maybe the only thing more beautiful than the cherry blossoms are gieshas and maybe the only thing more beautiful than geishas are the gorgeous kimonos they wear. In a lucky shot I was able to catch all three in a photo just exploding with color. 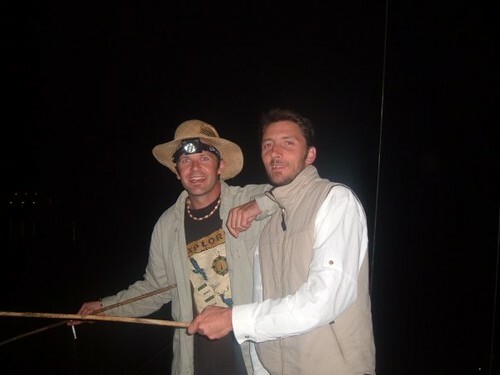 The equation for this picture is one bottle of consumed whiskey, one crazy Australian, one crazy American, a goofy hat, a torchlight, a couple of fishing poles, and a tour on a boat in Vietnam’s beautiful Halong Bay. What is the first reaction when a snake slithers ten feet from your bare legs in a foreign country where deadly snakes abound? Is it fear, panic, terror, jump ten feet in the air or all the above? I am sure I had the same knee jerk reaction when this occurred to me in beautiful Khao Yai National Park in Thailand. However, after recovering from the initial shock I got a closer look at the snake and realized something was already in its mouth. The snake was in the process of swallowing a whole horned lizard. Phew, my legs were safe. Ted Nelson has been adventure traveling since he was 10 years old following around his dad. He has gone hiking, canoeing, and cross-country skiing all over the Chicago area, America, and the world. 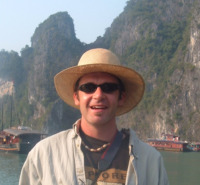 He writes adventure travel articles for Examiner.com. He can be followed by subscribing to his articles at Examiner or by the e-follow options below. Your website rocks. I am proud to have my pictures and writing on this site. Thanks for the honor. Geezzzz…. What a terrifying moment! I though that thing bit you for a second. Amazing collenctions you have! 🙂 I am not a fan of geishas but the kimono is certainly beautiful. LOL, never thought of it that way, but yea i guess so! Yea, we had a great time on the boat tour. He actually took the photo of me with the straw hat and glasses that is on my bio pic. Lovely shot of Hanami. I do miss those cherry blossoms! me to apple.. it’s PINK ! Happy travel tuesday! thanks for sharing your photos! HAha.. ted is so funny. 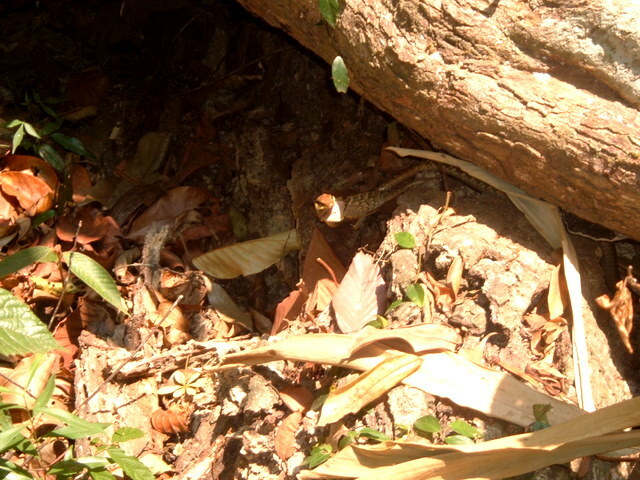 My version – Q: What do you see when you see a snake barely ten feet away from you? A: Take a picture and twitter it. LOL..
yikes! if i saw a snake up close, i wouldn’t have the courage to look closer at it! but what’s the safest thing to do … run away fast or back away slowly? I think either option would do the trick. Fortunately, this snake already had its mouth occupied, so no worries for me.